sheet definitives and resulting FDCs. Information received today has changed all that, but at least the confusion is over! 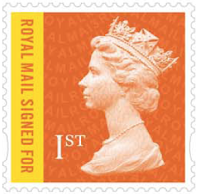 Collectors who have non-visible changes on standing order from Royal Mail will have received their direct debit advance information covering the PSB, the two Special Delivery stamps, and the two Signed For stamps. Those who have tried to place advance orders with Royal Mail for the four counter sheets have been told that there is no stock code for the 1st class RSF stamp. Dealers who have ordered (or who have standing orders for) the counter sheet stamps have already been supplied with three, but not the 1st class RSF. I asked about this yesterday and was told that this stamp had not yet been received in Tallents House. The proposed release of the Recorded & Signed For 1st Class (DS155WL) has now been postponed and it will be issued at a later date in 2019. The remaining 3 stamps due for release next month will still be issued as planned with the First Day of Availability of 4th December 2018. I'll reassess the First Day Cover options and prices in the light of this and publish new information next week. For those who have already written, I'll contact you direct. I'm sorry that the work involved with all the new Machin reprints has prevented me from adding information about the Christmas (and Harry Potter and Prince Charles) stamps so far. You will recall that last year there was a children's design competition for 1st and 2nd class (and Large) stamps, and these were issued, literally, alongside the religious (Madonna and Child) stamps. The counter sheets contained 25 religious above 25 competition, and the normal booklets contained 6 of each, although books of 12 religious stamps were also produced but were not widely available. We expected those to be the religious alternatives this year, but no announcement was made by Royal Mail. Indeed when I asked about the religious alternative I was told that Madonna stamps would be available but may not be generally distributed to post office branches. That was a matter for PO Ltd. So I was surprised to receive this pair from a contact in Glasgow, with the comment that "only a few sheets were distributed to branches in Glasgow". I duly asked Royal Mail for details only to be told that this wasn't something that my contact in 'Stamps and Collectables' knew anything about. Earlier this year we appointed ISP / Walsall to print our 2018 Christmas stamps. Due to a misunderstanding the 2018 reprint of the Madonna & Child Stamps, originally issued in 2017, were printed on a shared sheet with the normal Christmas stamps, in the same way as they were printed in 2017 when the Madonna and Child stamps shared a sheet with the Children’s Design Competition stamps. These sheets of half Madonna and Child and half Christmas stamps, were circulated to the Post Office network but are now in stock and available from Tallents House. The sheets concerned are 1st Class code AS4201KFS, 2nd Class code AS4201LFS. No other values are affected. This also constitutes a change of printer for the 2017 Madonna and Child stamps. My understanding is that (as last year) orders can be placed for Madonna or Postbox stamps, but not for the centre strip containing a se-tenant pair of designs. This can only be obtained by buying the whole sheets of 50 from Tallents House, or by finding them unfolded in a post office branch. It's unfortunate that communications between Royal Mail and their printers, and within Royal Mail, mean that this information was not available before the stamps were issued, and has only surfaced now that a collector has noticed, and a dealer has asked the question. I've no need to buy Christmas stamps from the PO and even if I had it is more than likely that most branches would have split the sheets of 50 so as to be able to easily sell either religious or secular according to customer requirements. We may never have known!, so thanks to AM in Glasgow for finding these and alerting me. UPDATE 18 December: a film on the MyRoyalMail website shows why it is that these stamps are not available in unfolded sheets - the ones at Post Offices are folded at the printers! UPDATE 6 December: these are now available to buy from our shop. We still don't know what happened to all those Madonna-only retail booklets that were produced and not distributed to branches last year! UPDATE: I've now seen both 1st class sheets. Both types have cylinders W1, reinforcing the belief that cylinder numbers really don't mean much these days. At the top right of the sheet the short-code for the split sheet is NVIF MC17 while that on the 2018 Postbox sheet is NVIF CHR18. The printing date is part of the cylinder as usual - in this case 17/06/18 for the split sheet and 03/07/18 for the 1st class only sheet. Usually on stamps printed in gravure the year reversed out from the phosphor bars. It would be very interesting to know which year (2017 or 2018) is reversed out from the phosphor bars on the Walsall reprints of the Madonna & Child stamps. As expected, it is 2018 on all stamps in the sheet. I'm also very curious about the Madonna booklets. Why they produced them last year if they aren't going to distribute them even this year?